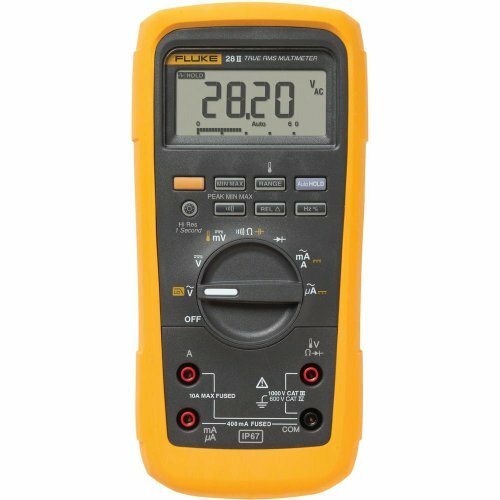 The Fluke 28II Rugged Industrial Multimeter defines a new standard for operating in harsh conditions with the features and accuracy to troubleshoot most electrical problems. The 28II meter has an IP 67 (waterproof and dustproof) rating, MSHA approvals, extended operating temperature range of -15-Degree C to +55-Degree C (5-Degree F to 131-Degree F, -40-Degree C for up to 20 minutes) and 95-Percent humidity, and have been designed and tested to withstand a 3 m (10 ft.) drop. The Fluke 28II multimeter is built to work in the toughest environments. Measures up to 1000 V ac and dc, measures up to 10 A (20 A for 30 seconds), has a 10,000 μF capacitance range and a frequency to 200 kHz. Features an extended ac voltage bandwidth of 15 Hz to 20 kHz. Built in thermometer conveniently allows you to take temperature readings without having to carry a separate instrument. The multimeter is designed to perform resistance, continuity and diode tests and has a min/max and average recording to capture variations automatically. Features a unique function for accurate voltage and frequency measurements on adjustable speed motor drives and other electrically noisy equipment. The 28II’s hi resolution 20,000 count display mode allows for more accuracy. Backlit keypad buttons allow for easy visibility in lowlit areas while large display digits and 2 level bright white backlight increase visibility.